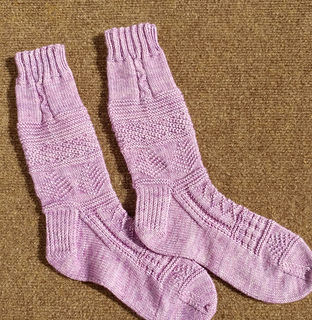 This was the Feb/Mar 2016 KAL sock for the Six Sox KAL Yahoo group. Perhaps my Scottish Mabon (surname) family ancestors wore knit clothing with similar patterning as decorate these socks. These socks showcase a medley of traditional stitch designs. Over the years these patterns have stayed popular as they are both easy to work up and are pleasing to the eye. These socks are knit cuff-down to the toe and feature the traditional heel flap and gusset construction method. Directions are given both in charts as well as line-by-line written instructions.